RALEIGH, N.C. — They traded punches with Evander Holyfield. They dunked a basketball on ice. They flopped around like beached whales. 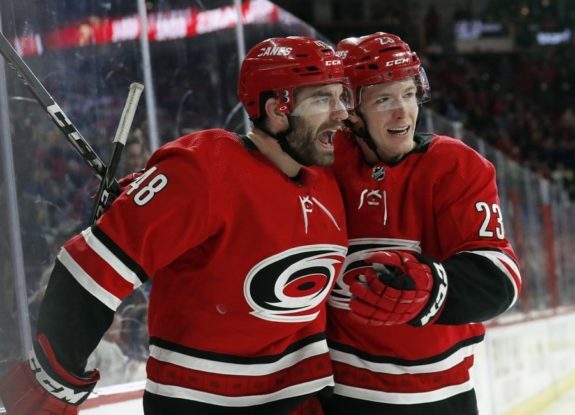 The Carolina Hurricanes have done plenty of unusual things this season, and here is one more: They are preparing for their first playoff series in a decade. That team dubbed a “bunch of jerks” over their wild, choreographed post-victory celebrations hopes to surge — or, perhaps more fittingly, Storm Surge — all the way to the Stanley Cup. 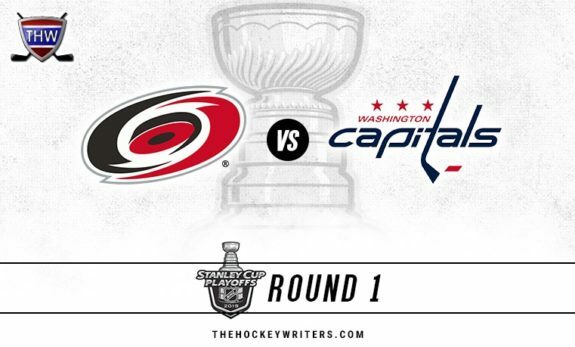 The Hurricanes, who open their first best-of-seven playoff series since 2009 on Thursday night at defending Cup champion Washington, are walking the fine line between savoring their rare-for-them accomplishment while not being completely satisfied with just making the field of 16. It has been nine seasons since the Hurricanes last skated in a springtime game that mattered. Only two franchises have gone longer between post-season appearances — the Florida Panthers from 2001-11 and the Edmonton Oilers from 2007-16, with each missing the playoffs for 10 straight seasons. Yet first-year coach Rod Brind’Amour isn’t just happy to be here. The only current Carolina player who was on the ice for the Hurricanes’ last post-season series was centre Jordan Staal — who at the time played for Pittsburgh, which swept those Hurricanes in the Eastern Conference finals. To finally end that drought, Carolina changed just about everything, from the players on the ice all the way up to the team owner. 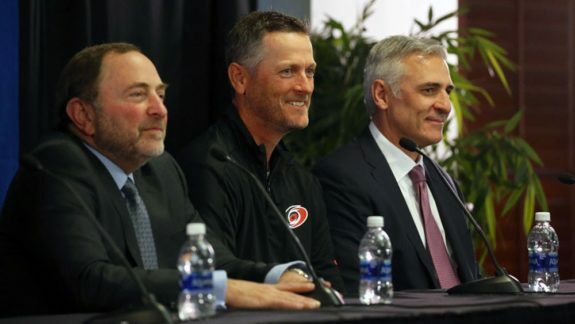 Tom Dundon bought a majority stake in the team from longtime owner Peter Karmanos Jr. last January, then promoted Don Waddell to general manager and hired Brind’Amour — who, as captain of the title-winning team in 2006, was the first player to hoist the Stanley Cup — as head coach. Along the way, the team’s culture changed. Williams was selected as team captain after a failed experiment last year in which Staal and Justin Faulk shared the captaincy, and the players became more accountable to each other. They’re also having more fun after games, thanks to those Storm Surges. Each one started with a slow, exaggerated overhead clap and ended with a different skit or activity. They celebrated March Madness by bringing a portable basketball hoop onto the ice and Trevor van Riemsdyk threw down a one-handed dunk . When Holyfield visited as a guest, they brought him onto the ice and the former boxing champ pretended to spar with Jordan Martinook. They marked Hartford Whalers night by flopping around on the ice like whales. And when veteran hockey broadcaster Don Cherry ripped the celebrations and called the Hurricanes a “bunch of jerks,” they turned the insult into a rallying cry — even selling T-shirts with the slogan at the team shop. So was this playoff appearance. Just a few months ago, the Hurricanes were 15-17-5 on Dec. 30 and one point out of last place in the East. Since then, they have gone 31-12-2. So now, on a day usually reserved for melting the ice at PNC Arena, they were doing something different to it — placing the playoff logos inside the blue lines. For Williams, who scored the winning goal in Game 7 of Carolina’s Cup run 13 years ago and came back before last season to try to bring the franchise back to those heights, it’s particularly satisfying.